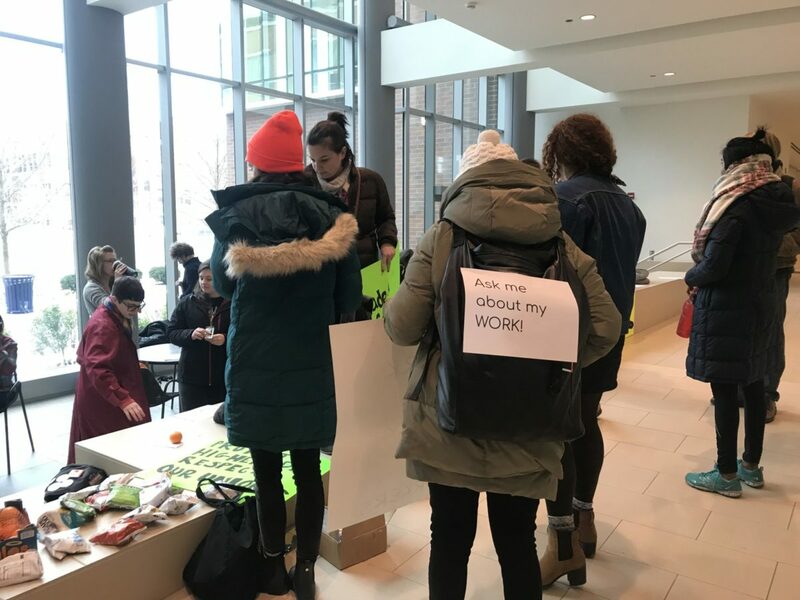 Mary Norkol | The PHOENIX Loyola graduate student assistants, non-tenured track faculty and adjunct faculty held a grade-in protest Dec. 11 in Damen Student Center to advocate for university recognition of their unions. 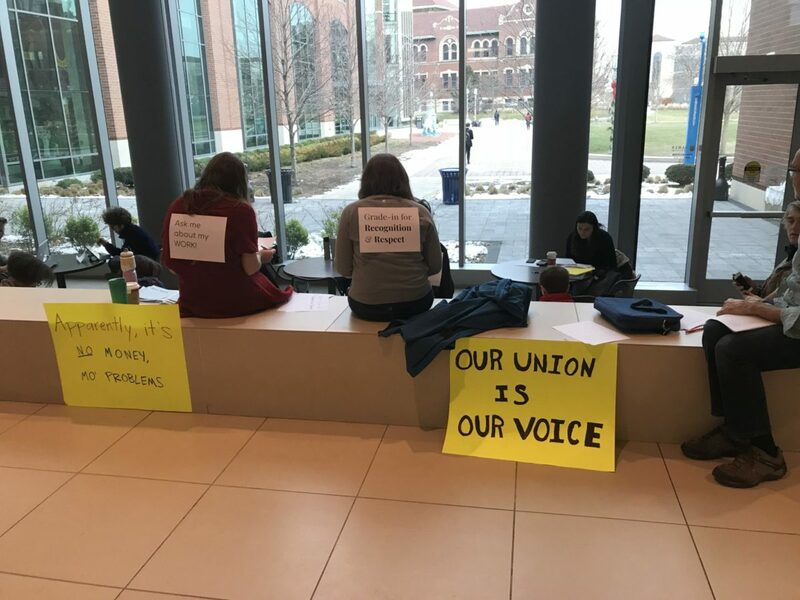 Loyola graduate students, non-tenured track (NTT) faculty and adjunct faculty participated in a “grade-in” Monday afternoon in Damen Student Center in hopes of gaining recognition from the university as active unions. Participants did their everyday work of grading papers and exams and holding office hours in a public setting to display the amount of effort and time given to their work. The Loyola Worker Coalition organized the event. In a post on its Facebook page, the group said the protest is partly in response to the recent Republican tax bill, which would raise graduate students’ taxes by categorizing tuition waivers as income. 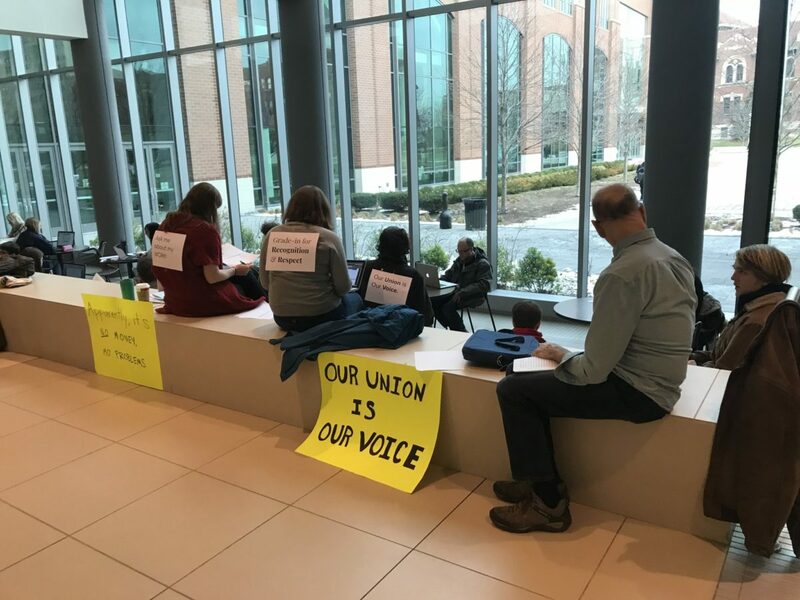 “The Loyola administration has stalled negotiations and made extremist proposals at the NTT faculty bargaining table, all while adjuncts haven’t received a raise in 10 years,” the Facebook post read. The graduate students have been recognized as official workers by a federal organization — the National Labor Relations Board (NLRB) — but still haven’t been recognized by Loyola. The university said on Oct. 17 it will not proceed with negotiations. 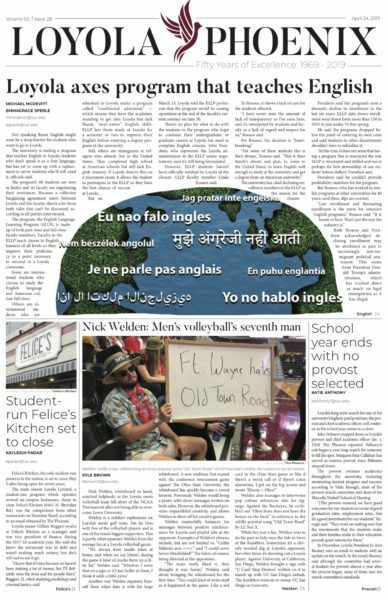 Graduate students are also prohibited from holding other jobs while working for the university, The PHOENIX reported in October. 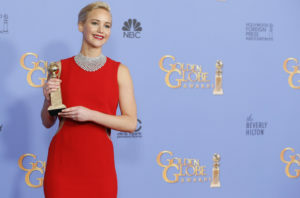 The NLRB is an independent federal agency that advocates for employees’ rights through union recognition and protection against unfair labor practices, according to its website. Alec Stubbs, a second-year Ph.D. student in the philosophy department, attended the demonstration. Stubbs, along with others, held signs reading “Ask me about my work,” and “Our union is our voice” among other phrases to communicate goals of recognition by the university. Stubbs said he does organizational work for the coalition; he’s on “what would be the bargaining team” if the graduate student union was recognized and could collectively bargain. Stubbs said gaining support for the demonstrations is difficult due to the busy schedules of graduate students, but it’s improved since the movement started last year. Lyle Enright, a fourth-year graduate student in the English department, said the graduate students love their work, but would appreciate if the university prioritized their work over profit. Along with graduate students and NTT faculty, undergraduate students and tenured faculty participated in support of those working for recognition and higher wages. Tisha Rajendra, an associate professor of Christian ethics, said she supported the fight for a bargaining contract with the university despite her position as a tenured faculty member. “I’m here at this grade-in to stand in solidarity with non-tenured track faculty members and graduate students as they seek to secure a bargaining contract for their unions … so that they can negotiate and secure access to better working conditions and wages here at Loyola,” Rajendra said. Evangeline Politis, Loyola’s communication specialist, said in an email to The PHOENIX the university respects students’ rights to “express their opinions and perspectives” and expects students to follow Loyola’s community standards while doing so. Loyola first-year undergraduate students Katarina Belscher and Alex Baertschi said they believe the university has the money to provide higher wages for graduate students. Belscher, a nursing major, and Baertschi, an environmental policy major, both said they have had graduate students as professors in classes and haven’t noticed a difference in the work being done compared to tenured faculty members. “I think [Loyola makes] plenty of money off of our tuition to be able to recognize [graduate students and NTT faculty] and give them more money,” Baertschi said.